Researchers at Binghamton University, State University of New York, have developed skin-inspired electronics to conform to the skin, allowing for long-term, high-performance, real-time wound monitoring in users. 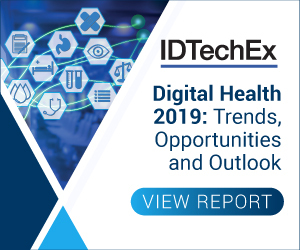 For more information see the IDTechEx report on Electronic Skin Patches 2018-2028. "We eventually hope that these sensors and engineering accomplishments can help advance healthcare applications and provide a better quantitative understanding in disease progression, wound care, general health, fitness monitoring and more," said Matthew Brown, a PhD student at Binghamton University. Biosensors are analytical devices that combine a biological component with a physiochemical detector to observe and analyze a chemical substance and its reaction in the body. Conventional biosensor technology, while a great advancement in the medical field, still has limitations to overcome and improvements to be made to enhance their functionality. Researchers at Binghamton University's Intimately Bio-Integrated Biosensors lab have developed a skin-inspired, open-mesh electromechanical sensor that is capable of monitoring lactate and oxygen on the skin. "We are focused on developing next-generation platforms that can integrate with biological tissue (e.g. skin, neural and cardiac tissue)," said Brown. Under the guidance of Assistant Professor of Biomedical Engineering Ahyeon Koh, Brown, master's students Brandon Ashely and Youjoong Park, and undergraduate student Sally Kuan designed a sensor that is structured similarly to that of the skin's micro architecture. This wearable sensor is equipped with gold sensor cables capable of exhibiting similar mechanics to that of skin elasticity. The researchers hope to create a new mode of sensor that will meld seamlessly with the wearer's body to maximize body analysis to help understand chemical and physiological information. "This topic was interesting to us because we were very interested in real-time, on-site evaluation of wound healing progress in a near future," said Brown. "Both lactate and oxygen are critical biomarkers to access wound-healing progression." "The bio-mimicry structured sensor platform allows free mass transfer between biological tissue and bio-interfaced electronics," said Koh. "Therefore, this intimately bio-integrated sensing system is capable of determining critical biochemical events while being invisible to the biological system or not evoking an inflammatory response."